Competitors from Oregon, Washington and California competed during the expo, in the Mustang Adoption Challenge, presented by the non-profit organization, Teens and Oregon Mustangs! Youth and Adult Contenders had just over three months to train and prepare their wild horses for the Challenge. The contest included Showmanship and Body Conditioning, Youth In-Hand, Teen In-Hand, Freestyle contests, Teen Riding, and Adult Riding classes. Following three days of fierce competition, the results were announced Sunday at the expo. The Youth In-Hand Grand Championship was awarded to Winter and her mustang Sophia; and the Reserve Champion prize went to Joe and his mustang Cupcake. The Teen In-Hand Grand Champion was Ilaria and her mustang Vespa, and the Reserve Champion was Renee with JD. The Teen Riding Grand Champion award went to Audrey and her mustang Wylie; and the Reserve Championship was given to Hannah with Maui. The Adult Riding Grand Championship was presented to Scott DePaolo and his mustang Wallowa Rose, and the Reserve Championship went to Rachel Jerome and Nick’s Valor. In the auction that followed the awards ceremony, the highest bid of all mustangs was $10,500 for Wallowa Rose, trained by Scott DePaolo. For more information on the Mustang Adoption Challenge 2018, go to http://www.teensandoregonmustangs.org. The Northwest Horse Fair and Expo once again hosted BreyerWest®, the Breyer® Horse model horse event featuring equine-related workshops for kids and adults, model horse hobby demos, and model horse shows. Turnout for the model horse shows was excellent, with entrants coming from as far away as New Jersey, Texas, and Canada, as well as from all across Oregon and Washington! All 3 days of the expo, free Stablemates painting attracted scores of youth to paint tiny model horses they could keep, and through the weekend BreyerWest offered hands-on workshops and free demos by hobby experts. 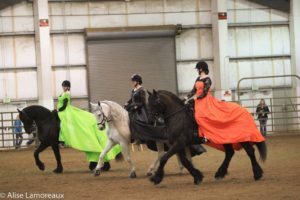 The Northwest Horse Fair featured outstanding equine clinics, lectures and workshops with first-class riders, trainers and instructors, teaching a variety of topics, including: General Horsemanship; Horse Training; Dressage; Naturally Gaited Horses; and Working Equitation. Among the weekend clinicians were Josh Lyons (TN), Kristi Wysocki (WA), Steve Rother (WA), Elizabeth Graves (MN) and Julie Alonzo (OR). In addition, radio and on-line TV host of Speaking with Horses, Wayne Williams (WI), was on hand. Equine entertainment at the expo was popular and diverse! Spanky and Dally, the adorable miniature horse and tiny Jack Russell terrier, stole the hearts of the crowd when Dally raced toward Spanky and launched onto his back for a ride! Then the little horse hopped over a jump with Dally on board! Their amazing tricks were fun and funny – performed at liberty with direction from trainer Francesca Carsen. The Blackpearl Friesian Dance Troupe showed off eye-catching costumes and choreography, as they danced to the beat of the music, with bright jewel- colored dresses flowing over the backs of their horses. Back for a second act, they donned bright sparkling red jackets that set off the grace and rhythm of their high-stepping equine partners. The Rim Rock Riders Drill Team presented the nation’s colors daily for the national anthem, and gave rousing demonstrations of precision drills on horseback, to music! “We had a wide variety of horses represented in our Breed Demos and Stallion Reviews”, said Mr. Cloe. A sampling of the demos showed the grace and high-stepping animation of the Andalusians and Lusitanos, and the fast, dainty gaits of the Peruvians – so smooth that riders could carry a glass of champagne without spilling a drop! The Canadian horses demonstrated a mixture of disciplines within the breed: driving, jumping, cavalry re-enactment ride, Dressage, Western and in-hand work. They also showed off the only palomino colored Canadian stallion in the United States! Stallion and breed groups hosted the public in their respective locales in the stall barn, answering questions about their horses, and providing an attractive atmosphere with creative stall decorations. Expo management hosted a Stall Decorating Contest and announced the winners: In the Breed/Discipline Showcase Category: the First Place prize was awarded to the Canadian Horse Heritage and Preservation Society; Second Place was given to the Kiger Mesteño Association; and the Third Place went to Cascade Icelandic Horse Club. In the Stallion Review Category: First Place prize was awarded to Woody Acres Ranch; the Second Place winner was Parrett Mountain Gypsies; and the Third Place prize went to Wild Horse Mountain Ranch. The twentieth annual Northwest Horse Fair and Expo 2019 will be held March 22-24, 2019 in Albany. The 2019 event will feature a Colt Starting Challenge and so far, Heidi McLaughlin has been confirmed as one of the clinicians. More details on next year’s event will be available in coming months. For more information about the Northwest Horse Fair and Expo, go to www.equinepromotions.net, email jjcloe@equinepromotions.net, call 765-655-2107, or join us for late breaking details and excitement, on Facebook (Northwest Horse Fair & Expo (NWHF)) and Twitter (@NWHorseFair). Sponsors for the Northwest Horse Fair and Expo 2018 were: Akins Trailer Sales, the presenting sponsor; Beelart Embroidery, the official event embroiderer; KMTR-TV, Youth Day sponsor; KRKT; Logan Coach Trailers; The Northwest Horse Source, the official publication of the Northwest Horse Fair and Expo; Phoenix Inn & Suites, the hosting hotel for theNorthwest Horse Fair and Expo; and Wilco.